The spiritual realm and a few of its inhabitants — angels and demons — are portrayed and discussed everywhere — from statues and paintings to poems and songs to the Internet. But are they understood correctly? With all the attention the spiritual world receives, Christians are bound to get confused between what is often assumed to be “common knowledge” about the spiritual realm and how the Word of God actually portrays it. 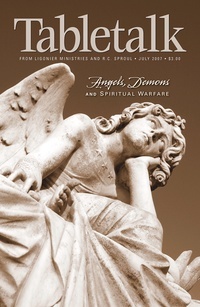 For this reason, the July 2007 edition of Tabletalk seeks to challenge many of the modern myths regarding this other-worldly reality by offering a biblical view of the spiritual realm. Contributors include R.C. Sproul along with John Blanchard, Stanley D. Gale, Phil Johnson, John Piper, R.C. Sproul Jr., and Gene Edward Veith. Tabletalk features articles about topics central to the Christian faith and daily, in-depth Bible studies.